For a while now I have wanted to write a professional blog but never knew exactly what it would be focused on. Last month my collaborators and myself were tabling at Anime NYC at the Jacob Javits Center in New York, selling our comic book, Ninja Express and related merchandise. During the weekend many people who stopped by the table asked us, “You made this?”. So many con goers express great surprise and disbelief that a person can make their own comic, and have it come out looking professional (if I do say so myself). The amount of interest expressed during Anime NYC and at previous cons I tabled at has inspired me to write this blog to impart some of the knowledge I picked up along the way to making my comic. First, a little background on myself. My name is Derrick Charles. I’m 33 years old. I have lived in Bronx, New York my entire life. I have been writing for about eleven years now. I write under the name D.M. Charles. I have never taken a creative writing class. I became inspired to start writing toward the end of my college years. I was majoring in Business Administration with a minor in Black Studies. After several years of studying business I realized it was not what I wanted to do with my life. At this time I was watching and reading a lot of anime and manga. I also rediscovered my love my love of comic books thanks to Marvel’s Avengers: Dark Reign storyline and the X-Men books that followed the House of M event. In spite of the enjoyment I got from these series, I did have problems with some of the stories. This gave me the crazy idea to try to fix these problems by writing my own story. Since then I have written dozens of scripts and published several projects, but I have mostly been focusing on Ninja Express due to it being the core project I have worked on. Starting your very first comic can be very intimidating, especially if you are starting out alone like I did. This is amplified if you are only the writer. 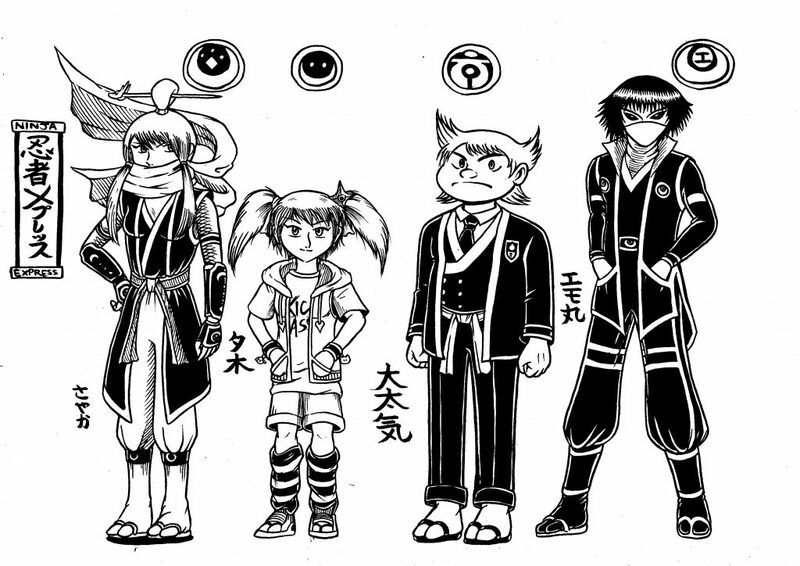 Currently, Ninja Express is a team of four. I write the scripts, David Rondinelli is the editor, Drake Tenta does the pencils & inks, and Osjua Newton handles coloring & lettering. The more jobs you can do as a comic creator, the better off you’ll be. If you are only a writer like myself you’ll eventually have to find a team, but before that, you need an idea. Before I ever started writing, I would for months brainstorm ideas, characters, plotlines, setting and mood. I did this alone and with any friends that would listen to me ramble on for hours about my ideas. Bouncing ideas off of trusted peers who are willing to listen and offer advice, ideas, and constructive criticism is invaluable and it makes this early stage feel a lot less lonely and isolated. For those introverts out there reading this, I know what you’re thinking, “But Derrick, I don’t have any friends. What do I do?” Join a writer’s group. There are ones online and ones that meet in person that consists of writers offering feedback and seeking it. I have posted on many Facebook groups looking for feedback on scripts I didn’t or couldn’t run passed my editor. Please remember this, when receiving constructive criticism, take it in the spirit it is meant. The person offering it most likely is doing so because they want to see your script improve. It is not an attack on you. Being able to accept and learn from critiques is a sign of one’s professionalism. I would also suggest offering to give feedback on other writer’s scripts. Editing others helps sharpen your own critical eye. When critiquing someone’s work, keep in mind to be constructive and try not to come off overly harsh (which can be difficult when reading a bad script). First, be sure they actually want critiques. I have had unpleasant experiences in the past when I have offered unwanted criticism. When I do offer criticism, I always try to offer it in the form of a “Criticism Sandwich”. Start with something you like about it, follow up with your issues, then finish with something positive. Having a positive interaction with other creators around your level of experience is invaluable. This is where you can begin building your networking skills that you will need throughout your career. Many of you probably already have an idea in mind. For those who don’t, you want to answer a few questions about your idea before you start writing: Who, what, where, when, why, and how. Ninja Express changed a great deal from its conception to the final published version, but I did try to answer many of these when I was coming up with the story. The concept for the series was to make an action/ comedy that paid homage to and parodied anime, manga and video games. My original concept for my series was loosely titled “Animanga”, and featured three leads, a 10 year old mecha pilot, a ninja girl, and a pokemon-ish little animal. When creating a story, I usually think of the concept first, then the setting develops out of that and the characters follow sometime thereafter. As the story was refined, Otaki, an out of shape boy, became the main character. The story began when he encountered Sayaka, a kunoichi, and through a series of events, joined her down-on-its-luck ninja clan, that functions as a delivery service. With this as the initial concept, Ninja Express came to mind as the perfect title. During this time was when i made my first two mistakes as an indie creator. The first was the title. I didn’t research if the name was taken. I found out some time later that several companies were already using the name, Ninja Express; my favorite of which is an Indonesian delivery service who’s customers often contact our Facebook page asking for information about their order. With the aid of Google Translate, I am always happy to reply back that I know nothing about their order but feel free to check out our comic. My advice, google everything: your concept, title, character names. The last thing you want is to base a concept around an idea or name someone else already came up with. The second mistake was the length of Ninja Express. During the conceptual stage I created dozens of characters, stories and subplots; enough for years of material. I recommend starting small for your first project. It is very hard to find a consistent team to work on a long comic series as your (and maybe their) first project. You also run the risk of having changing art styles from each issue, it is not uncommon for indie books to have several artists in a single book. Art changes can be jarring for a reader if the style change is drastic. Think of it like a television series recasting their main lead midway through. Also, if your first artist’s style is unique, replacing him or her isn’t an easy task. My advice, think small for your first project. Write a 1-5 page comic, or a stand alone story, or even a mini-series. Submitting work to an anthology is also a good idea. Some pair creative teams together and anthology stories are usually short and help build up your portfolio quickly. You can search online to find anthology that are open for submission. Collaborators are far more likely to join a small project with someone they don’t know rather than an epic. Some other benefits to this is you can quickly build a portfolio of work, which future collaborators and publisher will want to see. Publishers do not want to see your script or hear your big idea, they want to see finished work, I cannot stress that enough. Once you have your idea refined it is time to start writing. As I stated earlier, I had no previous writing experience. So I did a google search for “comic script examples”, found one I liked and used that as the template for my scripts (with a few edits to fit my personal organizational type). I’ll post a piece of sample script below for reference. I have seen some comic scripts that take more after television script format but I lean toward the “DC comics” script style, which has more strict panel and page organization. Having a structured and organized script is a must. Not only does it help insure you vision is accurately translated to your collaborators but it is a display of your professionalism. I still remember how impressed with my organization my first editor was when I handed him my script. That was his first impression of me and it was a good one. This started a professional relationship that lasted several years and was highly beneficial during the early years of my career. This is the basic advice I can offer anyone looking to get into self publishing. Some closing advice would be to understand this is a long, sometimes difficult, and always expensive endeavor to undertake. You will most likely not gain success overnight or even within a few years. Prepare yourself for that reality. I hope this and my future installment will be a useful guide to avoid my mistakes and a valued resource for the road ahead. Until next time True Ninjas!